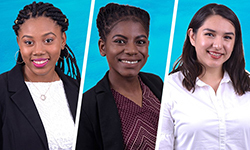 CW Students Naika Saint Preux, Desiree Scretching, and Amy Castillo were selected to participate in the i3 Scholar Undergraduate Research Program at the University of Pittsburgh, School of Information Sciences. The undergraduate program, supported in part by the Andrew W. Mellon Foundation, focuses on research and leadership development for underrepresented populations across the country and may lead to graduate studies and careers in the information sciences. Only 25 students from across the country are selected each year. Since 2012, CW has had 13 students participate in for the i3 Scholar’s program including this year! Two representatives from the iSchool Inclusion Institute (i3), visited CW to promote their “i3 Program.” i3 is an undergraduate research and leadership development program that prepare students from underrepresented populations for graduate study and careers in the information sciences and related fields. “We need to take you to leadership positions, you have what we’re looking for,” said Michael Depew, Project Director of the i3 Program. Only 25 students from across the country are selected each year to become i3 Scholars. Those students undertake a yearlong experience that includes two summer institutes hosted by the University of Pittsburgh and a team research project spanning the year. Since 2012, CW has had ten students accepted to participate in the i3 Program. said Depew in a recent letter sent to The College of Westchester. The i3 Scholars Program is supported in part by the Andrew W. Mellon Foundation and it includes students who are empowered to create change and make an impact on the people around them. Depew has enjoyed working with our students and he looks forward to strengthening the relationship between i3 and The College of Westchester, “CW students displayed and above average to strong set of research skills. Their attendance and presentations were impressive for first-timers, particularly considering the conference was attended almost exclusively by graduate students and faculty.” Past i3 Scholars have majored in information science, computer science, public policy, economics, business, and engineering, among others.